Amit Shah (Edison) - Book Appointment Online! 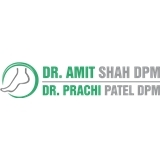 Dr. Shah specializes in treating conditions of the foot and ankle in patients of all ages. To make sure that you have the best experience possible during your visit, Dr. Shah will listen to your needs. He will take time to explain your condition and let you know exactly what it will take to correct it. She is amazing. Very nice. Makes you feel comfortable. She listened to me and walked me through what I needed. Gave me options and did not make me feel pressured into doing any of her options. Great environment!